A wonderful trailing plant that grows well in full sun Dichondra ‘Silver Falls’ (pictured right) is widely grown in hanging baskets and containers where it can be allowed to trail down over the side. Unlike some other species this is a variety that copes well in full sun and handles drier conditions than many. 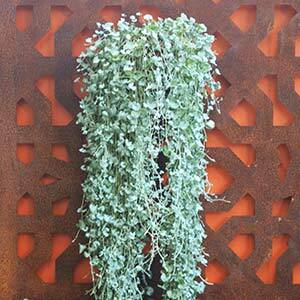 Originally from dry areas from Mexico through to Texas it is used mainly as a hanging basket plant, the foliage will cascade down for up to 2m in ideal conditions making it a spectacular curtain of silvery green leaves. It is also an excellent plant when allowed to trail over rock walls it is grown for the foliage although it does have small flowers. Plants can be grown from seed or propagated by root division in early spring or early autumn. Sow seed in a seed raising mix in a tray, surface sow and tap down lightly to ensure good contact withe the soil. The best time to sow seed is in spring unless you are using a heated propagation tray. Water with a seaweed fertiliser and then keep moist until seed germinate, usually within 2 weeks. Transplant or ‘pot up’ after plants reach a reasonable size. Grow on until ready to plant out. Plants are a little slow at first so be patient, the long trailing silvery foliage is well worth the wait. 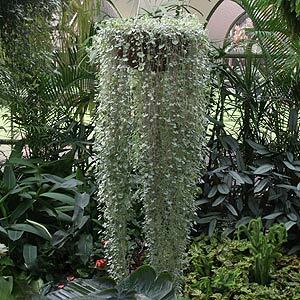 Often seen as being a hanging basket plant, this is a plant that can be used in a number of ways. Best in a position where the kidney shaped leaves can be shown off. Particularly useful when planted on a screen, wall or fence. The foliage can be allowed fall down naturally providing a visual break on these surfaces. Also suited to growing as a ground cover plant where smaller plants can be planted at around 20 cms apart to form a mat. Drought tolerant and hardy silver falls is also known as kidney weed, for the shape of the leaves as well as Silver Pony’s foot. Care is minimal, prune back in spring to keep in shape, ensure a well drained position and fertilise with a general purpose slow release fertiliser in spring. A little extra water in summer in dry periods as needed, but do not over water. Dichondra repens is a different species widely used as a ground cover plant.